Turnkey investment properties offer a great deal of promise for investors who like to diversify their portfolios, generate additional revenue streams, and grow equity. Yet, investing in turnkey properties isn’t for everyone, and, like all investments, there is risk involved. 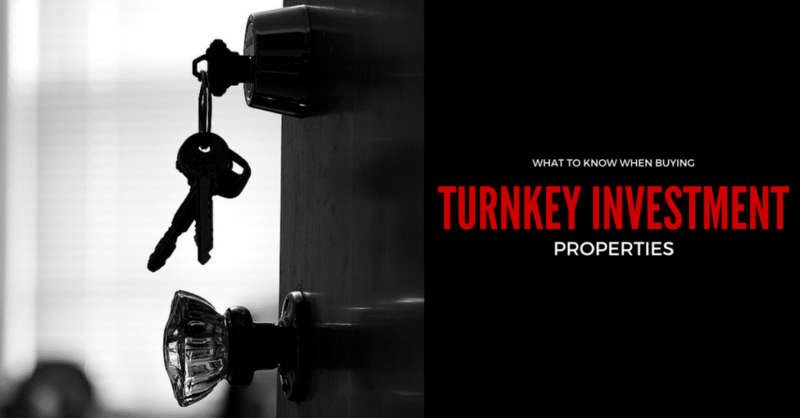 For you to know if investing in turnkey properties is right for you, it takes careful research and consideration. The generally accepted definition of turnkey real estate properties are those that do not need major repair work done and likely already have one or more tenants. You need only concern yourself with routine maintenance in the short-term, while ensuring you have a good property management team in place to run things for you and good tenants who will pay their rent on time each month and take good care of the property. A turnkey property might be a single home that you rent out to a local family, an apartment complex, or a commercial space that you lease out. One of the great advantages of turnkey real estate investing is the ability to do it in more than just your local market. Traditional real estate investing often requires you to be in the same market as your investment properties, so that you can keep a close eye on them, ensure any necessary work is done, find tenants, collect rent, pay bills, and handle the daily tasks of running the property. That can take a lot of time and money, and leave you with a loss at the end of the month. With turnkey investing, you partner with a property manager to handle the daily administrative tasks of running your investment property. That means you can look beyond your local market to identify the ones that hold the greatest profit potential in other cities and even other states. Because the property doesn’t need repairs or rehabilitation, the property manager can use his or her local contacts with vendors to provide efficient and affordable maintenance services. You need only ensure the profit margins are sufficient to make the investment worthwhile for you. Because you partner with a property manager, don’t have any up-front repair costs, and likely already have tenants when you buy a turnkey real estate property, you almost immediately begin receiving truly passive income. Essentially, you provide the financial support, while your property manager handles the business end. You need only sign occasional forms and ensure enough money is available to handle emergency repairs that might arise. So long as you have done your homework, hired a good property manager, and have a good handle on your monthly and annual costs versus revenues, you will receive absolutely passive income that leaves you with plenty of free time for other pursuits. Another advantage of turnkey real estate investing is the strong potential for growth. Once you have a good handle on how to research potential markets and find good properties and property managers, you can start using the time you gain from having passive income to find more properties in which to invest. When a new turnkey investment property complements your existing ones and immediately will produce passive income, making that investment becomes an easy decision that can grow your personal income and equity, while providing yet another revenue stream and more money with which to continue investing in more turnkey properties. It can be advantageous and a solid long-term investing strategy to buy multiple turnkey investment properties over time. For example, if you wanted to get to a point where you’re earning $100,000/year in a passive manner from your investment properties, you’ll likely need to own at least 10 properties. This may sound like a lot, but if you were to purchase one turnkey investment property each year for 12 years, you could achieve such goal. Imagine heading into retirement with a six figure passive income, AND knowing you’re sitting on a large chunk of equity as well! When weighing whether or not to get involved in buying turnkey investment properties, you must consider several caveats that might make it a bad move for you. At the top of the list is if you are looking to buy only one home or property in which to invest. Turnkey real estate investing works best when you have multiple properties generating multiple revenue streams each month. If something goes wrong at one, such as property damage, governmental interference, or other possible risks that threaten your investment, having other properties producing profitable revenue streams will help to offset short-term losses at another property. But when you only have one property, you run a much larger risk of a complete loss. Successful turnkey property investing requires patience, so you also should avoid turnkey real estate investing if you need money right away. It’s going to take time to locate a good investment property, buy it, find a partner to manage it, and ensure it has good tenants. You also need to have money available to pay for sudden repairs and other costs. If you are looking for a quick windfall, turnkey property investing likely won’t work, as it generates its maximum profits over a matter of years, via rental income, equity growth, and its potential sale in the future. Click here to learn more about buying turnkey investment properties.